Driving a motor vehicle definitely has its difficulties. We specialize in providing a useful resource to all types of vehicle operators. Our backup camera systems give you access to the view behind your car bumper, in a situation when it matters most: backing up. The way it works is through wireless technology. 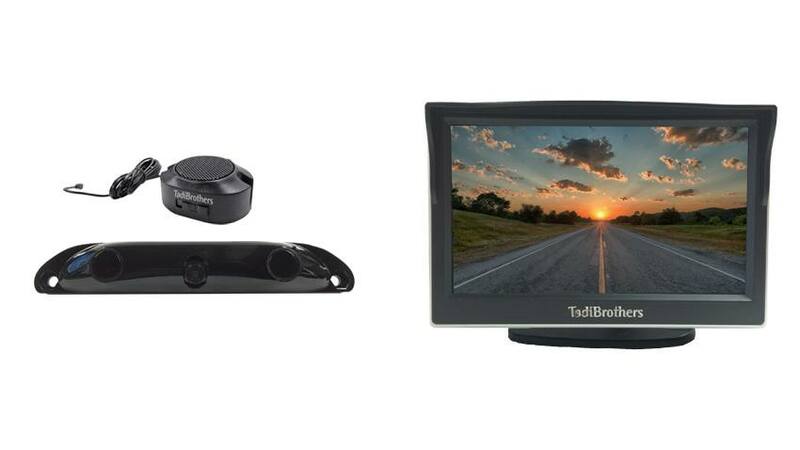 Our 5” color monitor with parking backup sensor and license camera bar create an ideal scenario for all types of backup situations. You’re able to view what’s behind you in crystal clear color imaging, you’ll be notified by sound when you’re running out of space, and best of all, you can use your new backup resource whenever and wherever you feel it to be necessary. In addition to everything else, this unique system helps you identify appropriately sized parking spaces. Your days of worrying if your vehicle will fit into a tight space are over. Your backup camera system will take the guessing game out of reversing your car in a crowded parking lot. You get 2 sensors surrounding a middle camera. It simply bolts onto your license plates. There is no drilling involved at all. The senor and camera bar is made of a high quality material that will stand in all weather conditions and it will look great installed on your bumper. We’re confident that you’ll love the convenience that comes along with our 5” color monitor with parking backup sensor and license camera bar. Find out more about what our camera systems are all about by checking out our FAQ page here. "After backing up into a few mailboxes, telephone poles and almost my neighbors child I knew it was time to get a back up camera. My accord does not have too much space on the dash and I did not want a mirror or visor monitor, so after discussing options with your salesman whom was very helpful, he suggested this monitor to go with the full frame license plate camera I was interested in. I am 63 years old and was able to set it up with the assistance of your technical support team and I couldn't be happier with the unit, great product and service." "I don't have a lot of dash space in my vehicle, so after discussing my options with your sales team, we concluded that the 5" monitor would be the best fit for my vehicle it was one of the least intrusive options available for a monitor. It is a great screen, does not take up any space and the resolution is top notch. If you have a small sedan and need something on the dash, take it from me the 5" monitor is a great choice"
" This was the fourth system I purchased from Tadibrothers, first 5 inch monitor and I'm very happy with it I was able to hang it from the ceiling in my truck and this way I can watch the horses while I'm driving down the road. It's a very customizable monitor works great in bright bright light and it was very durable I wish you had a remote control but can't expect much for the price. The quality exceeded my expectations and I strongly recommend this for any truck. Each one of my horse trailers have different needs I have six more that I will outfit with one of the systems but I like the fact that I can customize in mix-and-match the cameras however I like. " " I wanted to put them on her right in the space I have in my consul I couldn't find a minor with the correct dimensions until I found this one. It was very easy to install it was reliable and it works great in the day and night. I was very impressed with the picture quality and I'm glad that I got the high definition camera. It cost me a little more than I wanted but it was worth every penny. "